The product superficially resembles the Powerbeats3, including its signature earhooks. The Pro is completely wireless, however, unlike the Powerbeats 3, which has a cord connecting both earpieces. 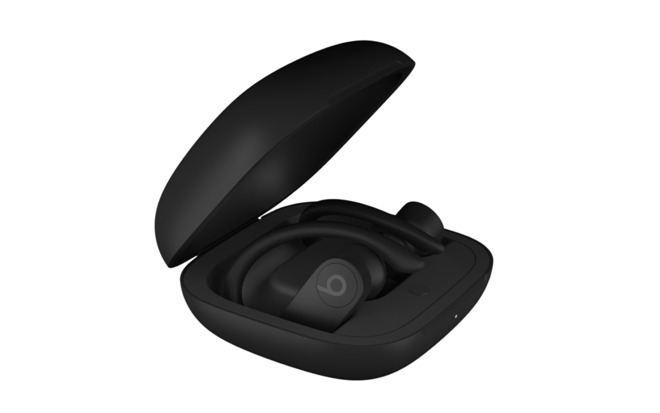 Black and white versions should be available, and the headphones will ship with a clamshell charging case, different from the gum-dispenser style used by AirPods. References to the Powerbeats Pro were discovered by Chance Miller and 9to5Mac. Inclusion in iOS 12.2 could mean a release is around the corner. Last week, a report suggested that a fully wireless Powerbeats model would ship in April. It may include the H1 chip from Apple's second-generation AirPods, enabling power-efficient operation and new features like "Hey Siri" support. While AirPods are more compact, Powerbeats are better equipped for fitness and sports thanks to their earhooks, which prevent buds from falling out, and a sweatproof design. AirPods aren't officially water-resistant, which risks electrical shorts or even low-level electrocution.